Gaia Steamer Review: The All-In-One Dream Cleaner? Chances are that if you want to get rid of bed bugs in your home, you’re going to be using a bed bug steamer as part of your treatment method. However, once you’re done treating for bed bugs, you probably don’t plan to start killing bed bugs in other homes. For those not interested in starting a new pest control business, that means the steamer will likely be promoted to house cleaning duty after the bed bug ordeal is over. This prospect makes it a good idea to find a steamer that will kill bed bugs but also serve as an exceptional cleaning device down the road. Most dry vapor steamers on the market are made for cleaning and sanitizing purposes — that’s why most of their attachments are brushes, carpet heads, and other parts for different surfaces you might find in your home. The best steam cleaners on the market usually combine steaming and vacuuming into one device. While they’re at it, these products also may come with direct injection and extraction of hot water or detergent. However, these models are often priced too high to be considered for most homes, or don’t meet the requirements of a bed bug steamer. The new Gaia aims to fit that role perfectly. 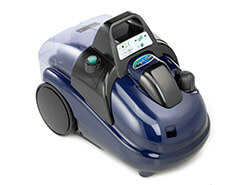 Packed into this compact body is a dry vapor steamer, wet/dry vacuum, direct injection and extraction. A single device could be all you need to leave most floors and surfaces as clean as the day you moved in. However, this steamer is no slouch when it comes to bed bug treatments — the Gaia features a powerful stainless steel boiler that delivers steam as hot as 260 degrees, and with up to 58 PSI to ensure penetration into cracks, seams, and folds. The Gaia might hit all the right marks on paper, but does it deliver in hand? Let’s find out. We’ve grown accustomed to steamers coming with a lot of attachments, but rarely do we see such a diversity of gear as we did when unpacking the Gaia. This beastly home cleaning kit comes with tools for everything from hard surfaces, carpets, upholstered fabric, and getting into any sort of crack or crevice that needs to be cleaned, degreased, or sanitized. Of particular interest to us were the steam gun, hose, and extension tubes. These were all carefully designed to handle the task of delivering steam and suction power at the same time. The larger tubes and hose are for the vacuum and extraction duties, while the smaller port underneath is for high pressure steaming and direct injection. The gun itself omits the usual trigger that you hold down to steam — instead, you’ll find a toggle switch for the steamer with another switch on top of the handle for the vacuum. The overall build and construction is about what we expected for this price range. It’s not feasible to pack all of these features into a durable, sturdy body for the price that the Gaia is available for. With that in mind, we’re not overly concerned by the generally thin, consumer-grade plastics that the Gaia is built with. If you need something that can handle being knocked around more, you’ll want to pay more for a commercial-grade model. The control console on top of the body is the most user-friendly design I’ve ever seen on a steam cleaner. Instead of a steam adjustment knob, where you’re not always sure how close to minimum or maximum power you’re at now, the Gaia’s steam control is a simple three-level toggle. Just choose between low, medium, or high steam pressure and get back to work. Similar set-and-forget controls are in place for vacuum suction power, and toggled power buttons are present for the steamer, vacuum, and injection/extraction functions. This layout is very quick and easy to learn, and the simple indicators for boiler status and water level make it easy to know when it’s time to start steaming or when it’s time to refill. The Gaia has everything you need for a bed bug treatment. To kill bed bugs hiding in the seams and folds of your mattress, box spring, couch, or other upholstered furniture, you want to use low pressure and a flat upholstery fabric attachment. For other hiding places, like baseboards, floorboards, bed frames, and the edges of the carpet, you should use a thin detail nozzle and higher pressure. Either attachment should usually be wrapped by a cloth to break up excess pressure and moisture. The Gaia provides all of this, and allows you to hit each hiding place with ease and efficiency. Ditching the steam adjustment knob and traditional trigger can be big usability improvements, if they’re your cup of tea. Choosing between three steam power levels and not having to hold down a trigger while you work makes the chores of cleaning or treating for bed bugs a little easier on you. It’s always nice when a product design can reduce the things you have to worry about without reducing functionality. Where the Gaia really shines is in the versatility of its cleaning ability. Need to clean up a dirty hard floor? You can either steam first and vacuum after, or you can flip both switches and do both at once. What about rugs and carpet floors, which conventional steamers tend to struggle with? No problem — just dilute a non-foam cleaning agent with water in the injection tank, vacuum the carpet to clear out surface-level debris, then activate the injection and extraction functions to pump steam and detergent to the very roots of the carpet fiber. The Gaia doesn’t do anything new. There are other steamers, other wet/dry vacuum cleaners, and other combination units. Some even have direct injection and extraction. However, none of the other models out there manage to combine all of these features in such a portable and easy-to-use integration, and the attractive price is a cherry on top that makes this device hard to pass on. The Gaia makes cleaning feel like less of a chore, and that’s pretty impressive. The Gaia is the first all-in-one home steam cleaner. With its combination of direct-injected steam and a wet/dry vacuum, you can clean and treat most surfaces in your home in no time.